Whomever discovered that the artichoke is edible once you break through to the heart is an absolute genius. In my book anyway. Artichokes can be used in dips, boiled, sauteed, stuffed or steamed. You can also consume artichokes in the most simplest fashion and that is following the receipe, How to Cook and Eat Artichoke, which shows how to prepare your home grown artichokes for consumption in the simplest fashion. But, before we can talk about consuming artichokes, we need to get you growing artichokes. Artichokes thrive best in warm weather, but that does not mean it won’t do well in cooler climates. In warmer climates, artichokes will grow as a perennial. Artichokes can be a perennial in cooler climates as well with some additional work. I will get to more on that in a moment. Starting artichokes from seeds is very easy. Whether you are in a warmer climate or cooler climate, start your seeds indoors 10 weeks out from when you plan on putting them in the ground. If you are planning on growing your artichokes as a perennial (not removing the plant every year), you will need to choose a permanent location. I will get more more on location in a second. For those in cooler climates, you want to start them a minimum of 10 weeks out from your final frost. Sow your artichoke seeds to a depth of no more than a quarter of an inch, in soil where the pH level is 6.5 to 8.0. So slightly acidic to even a bit alkaline. You can expect your artichoke seeds to germinate in ten to fourteen days. Once your artichokes have grown indoors for 10 weeks and you are ready to move them to outdoors, choose a location that receives eight or more hours of sunlight. When transplanting your artichokes you will want to space them out at least twenty-four inches. Artichoke plants will get pretty big. Once your artichokes are transplanted, be sure to give them a weekly heavy watering and feed them constantly with a good organic fertilizer such as compost or manure tea or fish emulsion. Artichokes require a heavy dose of the big three nutrients, nitrogen, potassium and phosphorous, so be sure to feed your artichokes weekly. 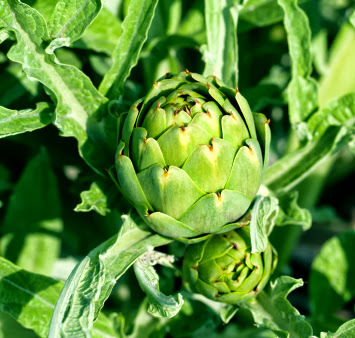 Your artichokes are ready to harvest when the buds are tight, firm and an even green color. If you notice your artichokes are starting to open, you will want to harvest right away as they will begin to lose some of their flavor. If you plan to grow artichokes as an annual, they will grow better if you do not follow sunflowers or Jerusalem artichokes. Now back to growing your artichokes as a perennial. If you live in a warmer region, zones 8a and higher, simply cut the artichoke back to ground level and lightly cover with some compost or organic mulch. In cooler zones, cut your artichoke plant back to twelve inches above the soil and mound some mulch such as straw around the artichoke base, then cover your artichoke plants with bushel baskets. You will want to place some more straw around the baskets. I have read that brussels sprouts are one of those vegetables that not only survive the cold weather, but the flavor of brussels sprouts will improve with a light frost. Brussels sprouts are definitely a vegetable that gives cooler weather gardeners a boost for their gardening buck so to speak. Brussels sprouts seeds are fairly small so make sure you plant them no deeper than a quarter of an inch. While brussels sprouts may do well in the cold, brussels sprouts seeds will need it to be a little warmer in order to germinate. You can start brussels sprouts seeds indoors before your last frost, but unless you have an extremely short growing season, there really is no need since brussels sprouts will still grow in the colder months. A slightly acidic soil (6.0 to 6.8 pH) works best for brussels sprouts. First take a pH reading of your soil. It may be fine as is. If you find that your soil is too alkaline (above 7.0), check out the article How to Lower Soil pH. In there you will find some excellent tips to adjust accordingly. If you need to raise your soil’s level because it is too acidic, the rule of thumb is to add lime or bone meal. For more information on raising your soil’s pH level, check out How to Iprove Acidic Soil in Your Garden. There you will find more tips on your soil’s pH level. Now that you have the sunny location in your garden picked for your brussels sprouts, you need to know how to plant them. Brussels sprouts are very large plants. Many varieties can grow up to three feet tall with a wide, but shallow, root base. I have read a few spacing options for brussels sprouts. One technique suggests you space out your brussels sprouts every eighteen inches leaving three feet between rows. That is a lot of space especially if your space is limited. In my experience growing brussels sprouts myself, and watching some friends grow them, planting just a few brussels sprouts plants eighteen inches apart in a square pattern will suffice. Think square foot gardening when picturing what it looks like. As a side note, just because you live in a warmer climate (Florida, the gulf coast, etc.) does not mean you can not grow these tasty treats. Direct sow brussels sprouts seeds into your garden from mid-October through Christmas. 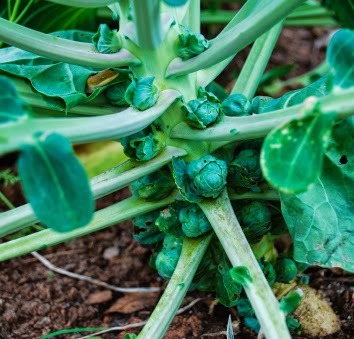 Fertilize every few weeks with fish emulsion or compost tea to keep feeding your brussels sprouts. Brussels sprouts are ready to be harvested when the buds are firm. They will usually be the size of large marbles (one inch). A good companion plant for celery, cucumber and lettuce, one cup of brussels sprouts contains 124% of the daily recommended amount for vitamin C.
My wife is more of a fan of eating beets then I am, which is why I continue to grow the many beet varieties available. Combined with beets’ ease of growing, this root crop can be a staple in anyone’s home vegetable garden. Not only is the root edible (the part everyone calls the actual beet), but beet greens are a tasty treat as well. If you weren’t sure what to do with beet greens, be sure to check out the article 7 Things to do with Beet Greens. If your growing season is extremely short, you can start your beet seeds indoors about two weeks prior to the last frost in your area. However, direct sowing your beet seeds after your final frost should suffice. Plant your beet seeds in a pH neutral soil about a half inch deep. Your seeds will germinate better when the soil temperature is 75 to 85 degrees Fahrenheit (24 to 29 Celsius). If it is still cool in your area, and you have decided to direct sow, try a cold frame, or hoop houses to increase the soil’s temperature. Be sure to space out your beets no less than four inches, especially when it comes to the varieties where the diameter of the beet root itself will be two inches or larger. Give your seeds a good amount of water in the early stages and then level the watering off to a more moderate amount as the beets continue to grow. Beets do not require a lot of nitrogen. 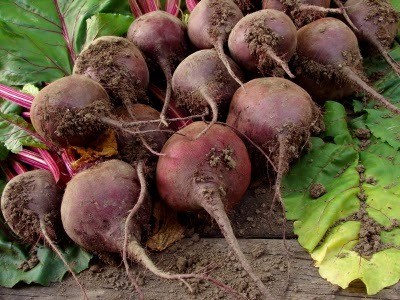 In fact, beets do not do well when exposed to a lot of nitrogen, so be sure to use a fertilizer to feed your beets that is low in nitrogen but high in phosphorous and potassium. There are plenty of organic varieties on the market. Beets make for great companions to beans, members of the cabbage family and lettuce. On our Vegetable Gardening Facebook page not too long ago, someone posted that they planted 9 bush bean plants in a single square for their square foot garden. If you are not familiar with square foot gardening, you read up on it here. If you have ever planted bush beans then you might be thinking, wow that is quite a bit. I agree as well that does seem like a lot for such a small area, but some square foot gardeners swear by it. I have not tried it yet myself, but planting 9 bush beans in a square foot area is something I am going to experiment with in the future. For now I want to concentrate on the basics of how to grow bush beans. There are a large number of bush bean varieties available for your vegetable gardening pleasures. The colors of bush bean plants are extensive as well. You do not need to simply default to planting green beans. Obviously whichever bush bean you choose to plant is up to you, but the growing instructions for bush beans, will be, for the most part, the same for all bush bean varieties. Unlike the pole bean variety, bush beans are determinate. That means they will grow to a certain size and then stop. In other words, bush beans, grow in a bush. Go figure. However, also, unlike pole beans, bush beans do not last very long. They are great producers, but if you want beans from your bush plants all season long, stagger your bush bean plantings every 7 to 10 days. This will give you great production throughout your season. Bush beans are quick growers, so in many areas of the world, starting bush bean seeds indoors is not really necessary. Some “experts” even say you should not start bean seeds indoors, however I have started bush bean seeds indoors in the past, and have not seen any ill affects on my bush beans. If you have a very narrow window of growing opportunity in your area, starting inside is not such a bad idea. Just do not move your bush bean plants outdoors until all frost subsides. Bush beans love slightly acidic to neutral soil. That is 6.5 to 7.0 on the pH scale. Take a quick reading of your soil’s pH level and adjust accordingly. You will get the most production from your bush beans if you plant them in area that receives a full day’s worth of sunlight. That is at least 8 hours. Bush beans will tolerate less, but your production may not be the same. Although, as mentioned earlier, square foot gardeners like to plant them 9 to a square foot, I like to take a more conservative approach and space my bush bean plants out every 6 inches in my vegetable garden. When the bush bean plants are small, keeping the water moist will suffice. However, as they start producing beans, you will want to water them a bit more than usual. Fertilize your bush bean plants every couple of weeks. Fish emulsion is a great organic fertilizer to use on your bush beans (as well as other plants in your vegetable garden). When to harvest your bush beans will be based on the variety you chose to plant as the sizes will vary. So be sure to check the back of your seed packet for more harvesting information. As a decent rule of tumb, when the pods are a quarter inch to three eighths of an inch in diameter, they are about ready. 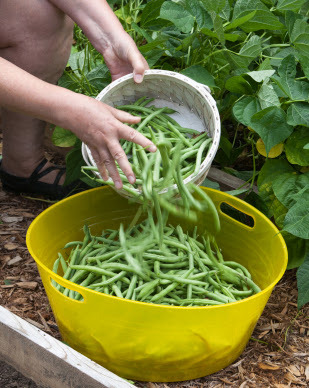 Because bush beans are prolific producers, you will have plenty to consume right away, and plenty to preserve for consumption, later in the year when you can not grow beans. If you are going to can beans, you must use a pressure canner. You can also freeze bush beans, however you will want to blanche them first. For either preservation method be sure to check the section below Additional Resources on How to Grow Bush Beans. I did not like the taste of asparagus until I was in my mid twenties. Not sure what happened to my taste buds that year, but all of a sudden, out of nowhere, asparagus, was not only tolerable, but I absolutely loved the taste and flavor, both raw and cooked..
Fast forward years later, and now asparagus is a staple in my home vegetable garden. Asparagus is fairly easy to grow, and because it is a perennial, asparagus will yield returns for many years to come. Some 15 to 20 years. The drawback, if you start your asparagus from seed, is that it can take up to three years before you get quantifiable production. So, if you love asparagus like I do, and want to add it to your home vegetable garden, like I have, there are two questions that you need to address before you begin. First, do you have an area in your yard or on your property that you can dedicate the next 15 to 20 years to? Second, are you going to grow from seed or use asparagus crowns from a local garden center? Keep in mind, that since asparagus is a perennial and that is has a long life span, that you will need to pick an area of your property where it can reside for the next 15 to 20 years. To me the longevity of asparagus is one of the positive factors since I do not have to replant it every year. When choosing your location make sure you pick a site that will receive at least 8 hours of sunlight daily. Many varieties of asparagus will tolerate, and grow well with less than 8, but if it gets less than 4, you won’t get much asparagus production. You will also want to make sure the soil is slightly acidic to neutral (6.5 to 7.0). You can pick up a low cost pH tester at any garden center for a few bucks. 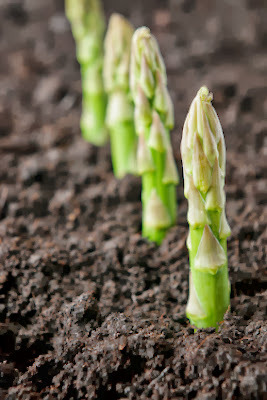 See below in the section titled "Additional Resources on How to Grow Asparagus" on excellent, organic ways, to lower or raise your soil’s pH level. Now that you have the spot picked out and your soil is all set, are you going to grow asparagus, starting from seed or already established asparagus crowns. The advantage of starting from seeds is that you control the environment from their beginning and the upfront cost is far lower than crowns. For example, in a pack of asparagus seeds we sell in our online store, you’ll get anywhere from 50 to 100 asparagus seeds, depending on which variety you choose. The advantage of asparagus crowns, depending on where and who you buy them from, is you can get edible asparagus spears in the first year, although year 2 is more the norm. Crowns cost a little more upfront and you really have no way of knowing the methods that were used to get them to that point, so those are some drawbacks. Not really show stopping though. Regardless of whether you are planting asparagus seeds or asparagus crowns, wait until fear of frost in your area has passed. When planting asparagus seeds, plant them no deeper than a half inch. With asparagus crowns, two to three inches deep. Cover with soil and give your new asparagus plantings a good watering. As a side note, you can also start your asparagus seeds indoors to give them a head start, however you still do not want to move them outdoors until frost has subsided. When grown from asparagus seeds, let your asparagus simply grow for the first 2 years. Do not harvest any spears (if they form at all). Your asparagus will look like fern plants. Just let that grow. For crowns, let them grow through for year 1 and begin harvesting in year 2. Keep your asparagus beds weed free. Asparagus will need all of the nutrients it can get and if your asparagus has to compete with weeds, chances are it will lose that competition. By year 3 your asparagus will be ready for harvest. Asparagus is one of those vegetables that will start to quickly lose it’s flavor once picked, so make sure you harvest only when you know you going to consume them, can them etc.